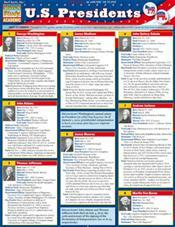 U.S. PRESIDENTS Quick Study Guide Our popular 3-panel (6-page) U.S. Presidents guide has been updated to include President Barack Obama, as well as additional facts and trivia regarding America's past Commanders-in-Chief. This is one comprehensive resource that no student or history buff should be without! Points of interest are set off for readers to find easily, and the chronological arrangement of every President from #1 to #44 makes quick reference a snap.